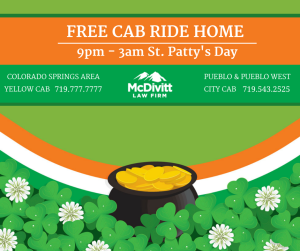 McDivitt Law Firm is offering free cab rides home on the evening of March 17, 2015, from 9pm – 3am to help keep our roads safe while people are out celebrating St. Patrick’s Day in Colorado Springs and Pueblo. 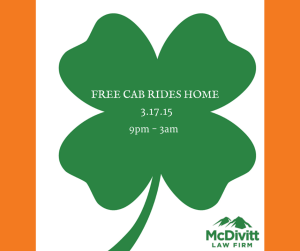 If you’re heading out to celebrate on March 17th, McDivitt encourages you to have a plan for how you’ll get home. Either designate a sober driver, arrange to have someone pick you up, or hail a cab on us. 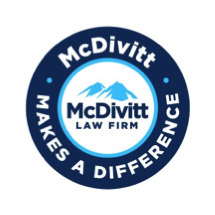 McDivitt Law Firm is a Colorado-based law firm that has been providing legal representation to injured victims and their families throughout the state of Colorado for more than 40 years. Founded by Mike and Karen McDivitt, McDivitt Law Firm has an experienced team of lawyers, paralegals, and support staff who provide their clients with caring and thorough legal service. Visit www.McDivittLaw.com to learn more.